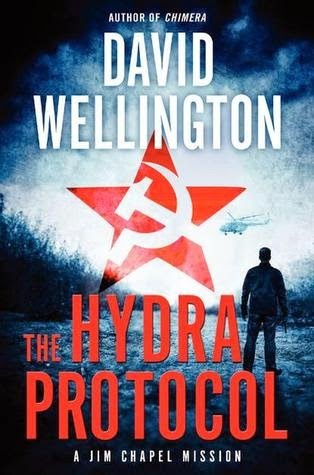 On a routine mission involving a sunken Soviet submarine in Cuban waters, wounded Special Forces veteran Jim Chapel, back in action thanks to medical technology, unexpectedly meets Nadia, a beautiful Russian agent. Nadia shares shocking intel about HYDRA, a forgotten Cold War supercomputer that controls hundreds of nuclear missiles aimed at the U.S. Just one failsafe error, and America will be obliterated. And there have been glitches in its programming . . .
To disarm HYDRA before it plunges the U.S. into nuclear winter, Nadia and Chapel must travel across Eastern Europe and infiltrate a secret base hidden deep in the steppes of Central Asia. But as these uneasy allies discover, not everyone wants the weapon out of commission." I read the first Jim Chapel book a while back and I really liked it, so I had high hopes for this new novel. However, it comes up just a little short. Just like in the last book, Chapel is tasked once again with a super dangerous mission that couldn't be more critical. If he fails, it could me nuclear holocaust for the entire world. Angel, his mysterious assistant, is back and this time Chapel finds himself working with the lovely, exotic, Nadia. He is still reeling from a recent set-back in his relationship with Julia, and Nadia seems to be trying to seduce him. So, Chapel is torn between his lingering love and his desire for this woman who wants him right now. And the conflict within him is making it even harder to complete his mission. As before, this is exciting and fast-paced. There is a lot of technology and plot twists and turns, and it makes for a fun spy novel. For me, this just wasn't as good as the first book. What I initially loved about Chimera, was that it blended monster sci-fi with a spy thriller. In this book, it's just a spy thriller. Wellington is known for his previous series about zombies and werewolves, so I had thought that Jim Chapel would be fighting monsters in all of his books too. The first was called Chimera, and was about genetically engineered humans, and since this one had the word "hydra" in its title, I assumed it would be similar. Finding out that it wasn't was honestly a disappointment. I read thrillers from time to time, but I definitely prefer ones with a supernatural or sci-fi element. So, if you want an action-packed spy novel, this is a good read. If you were like me, and hoped to see monsters again, you may be disappointed. I give this one three stars.